Behind these walls lies a golden past. A city of the elite - the premiere place of Asia once stood there almost three-quarters of a century ago. But then again, war took its toll on this place and turn it to ruins - it has never recovered since. Almost everything but the Walls were destroyed during the War. And walking in Intramuros now will remind you of the past, although almost every structures there were mere duplications of what they used to be. Still, this place represents the heart of Manila - chaotic, reviving and struggling. I heart Manila. Do you? My personal memories of Intramuros are totally gone. Without bloggers like you who features it, I would be lost. I really would like to visit this again someday. one should really explore intramuros. everytime i have friends or visitors from another country, i always recommend intramuros. Intramuros should be conserved for future generations. every square foot of this place holds historical interest we all should learn from. 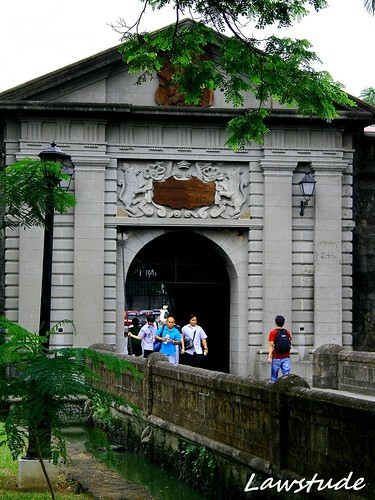 good thing there are restoration efforts to preserve Intramuros. this place needs our support. I love how you make all your photos so personal! Imagine if there was no World War II that destroyed most of the structures inside the Intramuros! But as it is, it's still a great place for us to learn a lot about Philippine history. Lovely post on the historical building. I like the photo of the chain. Whan I was in college, lagi kameng umaakyat jan sa walls. Sarap tumambay. Ingat lang malapit sa golf course, lagi may mga bola. never been to intranuros. parang tuloy hindi ako pinoy, makapaxal nga minsan.. hehe..
1st time po napadaan dito..can we exchange links??? Intramuros is really nice. An officemate went there recently. Ganda daw, kaya lang she got the impression that the government isn't spending much for its maintenance. Sayang naman. I really wanna visit Luzon na, and get to visit this too. gusto ko yung shot mo sa chain at sa manila city hall... ganda! It has been years since I last set foot on the place. A real place to learn history. Hi I'm J. "Pepe" Villanueva Cabrera. My photoblog's name is La Fotografia de Pepe. In "a Fountain, a Statue and a Hotel" isn't that the Palacio del Governador? Is it a hotel now? before it houses the Department of Education. our school's favorite spot for educational trip. it will bring u back to History.